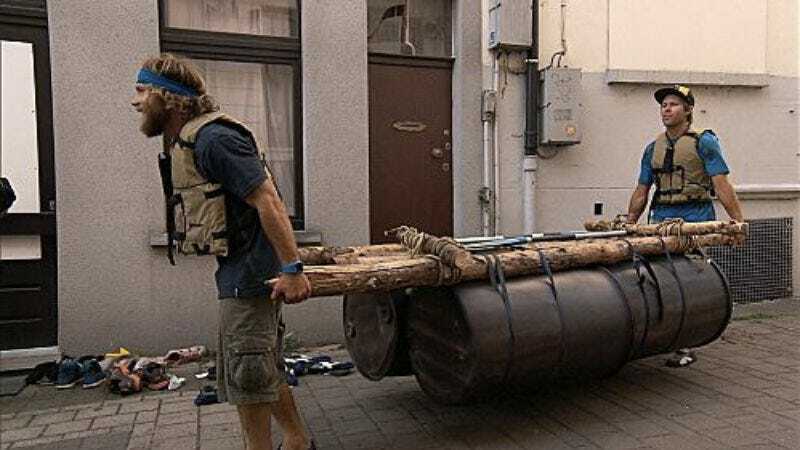 The first episode of this season of The Amazing Race featured a clue that was hidden in plain sight and nearly proved to be the undoing of Bill and Cathi. This week, the season came full circle with what must be a TAR first: The only team that actually managed to find the clue hidden in plain sight is the team that ended up being eliminated. It’s a shocker of an outcome that sets the stage for a wide-open finale. That Andy and Tommy would think the famous film director/actor is a character from a Belgian comic strip is another reminder that the Dudez are somewhat lacking in the brainz department—but not our last reminder. Not that their error has any penalty at all, since all four teams end up taking the same flight to their next destination: Panama City. Here, the teams must take a spooky boat ride through the dark of night to a native village, where they will spend the night and then get tattooed in the morning. The tattoos lead the teams to the San Francisco Bay Towers, where the Roadblock awaits. One member of each team must walk a tightrope between the two buildings, and since this is the final Roadblock, teams have no choice about which one of them it is. (This is the first time I’ve noticed the clue itself specifying which member of each team must perform the task, but I assume that’s always the case with the final Roadblock.) It’s not really a heart-pounding task, since the tightrope walkers are strapped with all manner of safety harnesses, but at least it gets a “Holy balls!” out of Cindy, which made me laugh. The Detour choices are Filet (in which teams deliver heaping armfuls of seafood to various fishmongers) and Sole (in which teams cobble a pair of sandals). All teams except Marcus and Amani choose Sole, but because the teams have been traveling everywhere by cab, and the cabbies have been sharing information with each other, Marcus and Amani end up at the Sole task anyway. At this point, I thought the best move would have been to forget about the fish market and make the shoes, but Marcus and Amani choose to stick with the Filet task. They're right to do so, it seems, as they are able to make up some time and leave the market in second place. As usual, Andy and Tommy are in first place, and it looks like they’re going to cruise into the final three, where they’ll be the odds-on favorites to win the race. But one clue remains between them and the Pit Stop—and it might well have been the most fiendish clue in TAR history. The name of the Pit Stop location is hidden in the pattern of a dress worn by one of a group of dancers. The Dudez don’t see it, but they do see the word “Balboa” on some of the medallions the dancers are wearing. They then embark on a wild goose chase with their cabbie, who takes them to the Panama Canal, and then to the statue of Rocky Balboa, which I had always thought was in Philadelphia. (What’s that? Different Balboa? Never mind, then.) None of the other teams spot the clue in the dress either, but Jeremy makes a sketch of a building on one of the medallions, which fortuitously turns out to be the building they have to find. Ernie and Cindy and Marcus and Amani make the same mistake as the Dudez, thinking that their destination is “Balboa,” but this time, their chatty cabbies save their bacon. They all follow Jeremy and Sandy to the correct spot, and thus are the first three teams to arrive at the Pit Stop. Although Andy and Tommy return to the dancers and actually manage to spot the word hidden in the dress, it's too late. The dominant Dudez, having won six of the legs, are out of the running. Their departure leaves the final leg without a clear favorite, and with any luck, will lead to a nail-biting outcome. And there’s no need to feel sorry for Andy and Tommy, who still have those sweet customized Fords coming to them. “Sounds like we’re about to get a crash course in head-shrinking.” Not the most culturally sensitive comment, perhaps, but you have to admit, that would be a hell of an Amazing Race task. 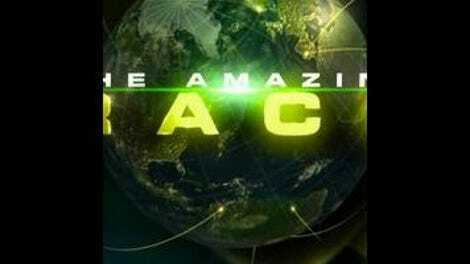 Next week: Who will win The Amazing Race? I’m still pulling for Marcus and Amani, but if they fall behind and he says anything about throwing a Hail Mary on 4th and long, I may reconsider.